For the most part, my DNA results have been a side note to my regular genealogy research. I’ve worked out two matches in the two years since testing. Most of my matches are vague, 4th to distant matches. 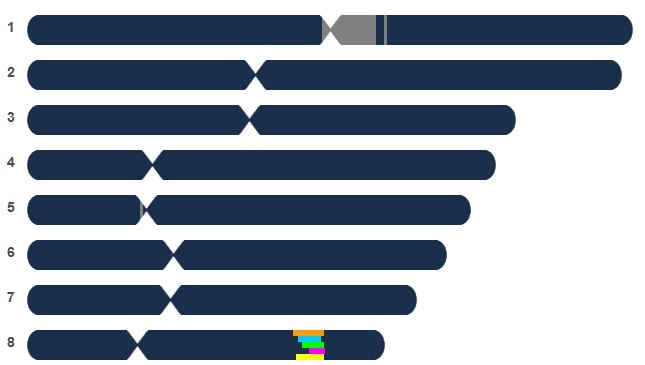 So, why did this one DNA match catch my interest? I will reveal only a little bit about my match as they have not answered my email and I will respect their privacy. When I saw the surname Lapuyade in my results, there was no mistaking that it is French. If true, this person was from my dad’s side of the tree. My match is in the 3rd to 5th generation range. Both sides of my dad’s tree come from the same villages and were there for several generations. That helped to narrow things down. Since many French records are online, I decided to see what I could find. The person’s name was unusual, so I’d do a few google searches first. I easily found obituaries for this person’s relatives. I made notes summarizing my finds. The family is from the right region of France, but not the right villages. My dad’s family is from a handful of village on one side of Oloron Ste. Marie and these people are on the other side. I conferred with a cousin who lives in the area. He was unfamiliar with the surname and doubtful that there was village hopping that far away. Possible but not likely. This family came to California much later than my grandfather. This was fortunate because most of the obituaries I found listed the village they were born in. I began filling out their pedigree. With some help from my cousins, we have worked the tree back to the early 1800s. Up to 1800, there are no connections. The Lapuyade line stays almost entirely in Aramits and Arette. My people securely ensconced in Castet, Izeste, Escout, Escou, Arudy, and Ogeu les bains. I found an article that gave a brief history of the family in California and France. This gave me information on the maternal line. Having worked back the paternal line, I worked on the maternal line. This line leads to a new village, Lescun, but it’s still on the wrong side of the tracks, so to speak. There is another problem with the maternal line. The most recent ancestor’s father is unknown. This isn’t rare with the French. It was the practice to set up house, start a family, earn a little money, and then get married. You find children recorded who are born before the marriage. If you are lucky, the father is listed in the birth record with the term “fils naturel” or “fille naturelle” showing they are not legitimate. You may also find that the couple married a couple of years later at which time the father declare his children born earlier. On this same tree, I have a found a case where the daughter’s marriage record gives details about how she was born “fille naturelle” (illegitimate) but was made legitmate when her parents married three years after her birth. The parent’s marriage date is given in the daughter’s marriage record as proof. In the case of this line, the child is born in 1901. There is another child born two years later with the father still undeclared. It’s possible that a marriage took place later, but the records aren’t available online for later periods. I was able to follow one surname, Nouque, but there is no connection to my tree. One nephew of this line moved to the village of Escout around the 1870s. Escout is a village I have ancestors in. I found this person’s marriage record. The problem being this connection may be too recent. Their offspring may marry into my line, but would they carry the DNA that my DNA match shares with me? Still, I’ll keep this handy. It may prove that they had family in Escout earlier than I know giving him a reason to move there. Having reasoned that out, I’ve decided that my match and I, because of the wide differences in our ages, are not from the same generation. He is more likely my Dad’s 3rd, 4th, or 5th cousin…I would be one of those once or twice removed kind of cousins. May Dad may even be a “removed” cousin. Knowing that, I am going to focus on the last generation I’ve located. I’ll continue to move their lines backwards in hopes that one of them married someone from one of my villages. It may be that one of my lines was in my match’s villages prior to where they lived in the 1800s. Having the big hole on paternal side of the maternal line means I must worry that our connection is within that line. I hope not. The only hope then is that the father was known, that the descendants know who the father was, and that they will answer my email. We both match 6 or 7 people on the same span on chromosome 8. It is possible that one of these folks has already worked out their connection to either line and has our answer. Impatience is a disease so many genealogists suffer from. I admit it. I am a sufferer. After researching for 3 days and filling in four generations of my DNA match’s pedigree, I don’t have any idea where we connect. I know…4 days is not long enough! Still, I was hoping for a “Eureka” moment. It teaches me again that DNA is a tool that aids genealogy research, but it is only one tool. Once a match is found, that is just the beginning. Finding the connection will take quite a bit of research. I’ll continue my research. Somewhere in the records is my DNA. Now, where is it hiding?